Hatfield Ham $2.50 Sale Thru 6/14 = $0.50 Again This Week! 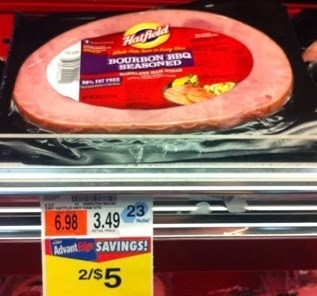 Hatfield Ham is on sale again at PC for $2.50 thru 6/14 = $0.50 w/ coupon! 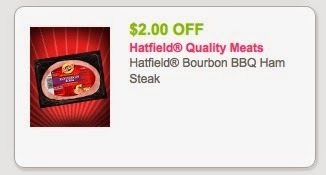 $2 off any One Hatfield Bourbon BBQ Ham Steak - use zip code 17103 if needed. When I called in to the Price Chopper at Wilton and Saratoga today both were out of stock of the Hadfield Bourbon ham. I hope they re-stock soon as I enjoyed the ham when it was on sale before and would like to try the Bourbon flavor. I am not familiar with how often they re-stock. You could get a raincheck at customer service that is valid for 30 days or if you ask they may just let you substitute any of the other Hatfield Ham Steak varieties for the Bourbon one and use the coupon on that instead since they are out of stock. The coupon will go thru beep-less.